Seventeen-year-old Americans Taylor Fritz and Reilly Opelka have only played once, and that was just two months ago, in the first round of a Futures tournament in Spain. Their second encounter will be in a much grander setting, when they take Court 18 at the All-England Lawn Tennis Club Friday with a place in the Wimbledon boys final at stake. 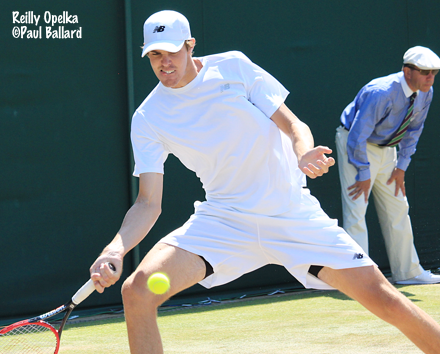 The unseeded Opelka advanced to his first junior slam semifinal with a 6-3, 6-3 win over No. 10 seed William Blumberg, while top seed Fritz reached the Wimbledon boys semifinal for the second year in a row with a 6-2, 4-6, 6-0 win over No. 11 seed Yunseong Chung of Korea. 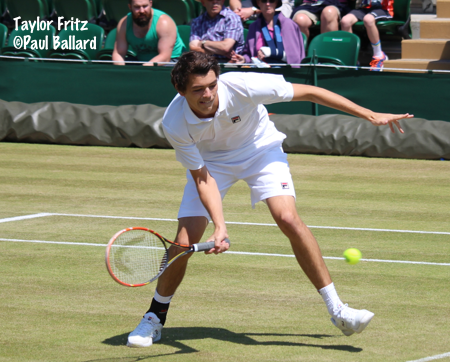 Fritz had not needed more than an hour to complete his first three wins this week, but a rough patch in the beginning of the second set and Chung's improved play made him realize he would need more from his game. "In the second set he just really upped his game," said Fritz, who was down two breaks at 3-0 in the second set. "And it didn't help that in the very first game the sun was in my eyes and I just couldn't find a way to toss it to where it got out of the sun. What I needed to do was accept the fact that he was going to play a lot better and up my game, put a lot more effort into it, but I didn't. I took the easy way out of the points, tried to hit winners, put more on the ball, do shots I shouldn't do." Fritz got one of the breaks back and was up 0-40 with Chung serving at 3-2, but Chung got out of that game, saving five break points and finished off the set. Fritz held quickly to start the third set and winning a lengthy second game proved to be the turning point of the match. "When we had that long service game, and all the points were like, there was no first ball then miss, they were all so long and tiring," Fritz said. "I knew I was tired and he was doing more running than me so I knew he must be tired too, so I figured if I could just get the break and consolidate it, that would go a long way to helping me win the match." Fritz got just 48 percent of his first serves in play. "I'm surprised it was that high," said Fritz. "This match was the worst I've served maybe this whole year. I served horrendously. When I got the first serve in, it did nothing. I think I only hit 130 once or twice and my average speed was like 110. It was so weak. And it was really killing me." Opelka was happy with his serving against Blumberg, making 67 percent of his first serves, which averaged 123 mph. "I did serve really well," said Opelka, who said he focuses more on his placement than his speed and did not look at the serve speed readout on Court 12. "I thought I served smart, kept him guessing. It really is just when I feel he has no read on what I'm doing, he's almost picking a side." Opelka, who saved a match point in the first round, had lost to Blumberg in the their previous two matches last year, and said Blumberg beats him regularly in practice. "He has my number pretty good," said Opelka, a semifinalist last week at the Grade 1 in Roehampton. "He beats me in practice nine out of ten times. I played really well today and he didn't play as well as I know he can. I thought I played great today, the best I've played so far. At Roehampton, I served really well, but I didn't feel like I played as well as I could have from the baseline. Today was good." Although Fritz's 7-6(2), 6-4, win in the first round of the Futures in Spain is their only official result, Opelka is well acquainted with Fritz's game. "I play him in practice a ton," said Opelka. "I know him well, he knows me well. We both know what to expect tomorrow and it's just a matter of who executes better. One of us has to play really well to win. He's a great competitor. Even when things aren't going his way, he still finds a way to win, which is why he's number one in the world. It's going to be a tough fight from a mental standpoint, no doubt, because he's such a good competitor." Fritz discounted his win over Opelka in Spain. "He wasn't at his best, he wasn't one hundred percent physically," said Fritz. "He had a bad arm or shoulder or something and he couldn't serve as big as he usually did. I still stood at the fence to return it, but it wasn't as big as usual. We both broke serve so many times. But against him, it's just serve and return. That's all you need is serve and return." As the ITF's No. 1 junior and a semifinalist last year, Fritz is not satisfied with another trip to the last four. "This is really where it starts for me," said Fritz, who lost to boys champion Noah Rubin in the semifinals. "I want to push farther. Whenever I can't do better in a tournament than how I did in the previous year, it really, really disappoints me." Unlike last year and this year's French Open, there will be no all-American boys final, after No. 7 seed and French Open boys champion Tommy Paul was defeated by unseeded Patrik Niklas-Salminen of Finland 6-4, 1-6, 6-4. Paul dropped serve in the first game of the match, and although he got the break back in a five-deuce game to make it 4-4, his first serve disappeared in the next game and Niklas-Salminen served out he set. Paul dominated the second set, as Niklas-Salminen's unforced error count rose, but the third set saw the 18-year-old left-hander get back on track. Paul had a break point at 2-2 in the third set, but missed a routine backhand wide, and Niklas-Salminen held. No other break opportunities surfaced for either player until Paul served at 5-4. Up 30-0, Paul saw his backhand desert him and two unforced errors later, Niklas-Salminen, who beat No. 2 seed Duck Hee Lee on Wednesday, had his second straight upset victory. Niklas-Salminen will play No. 12 seed Mikael Ymer of Sweden. Ymer, who received a wild card after forgetting to enter the tournament initially, defeated unseeded Alvaro Lopez San Martin of Spain 7-5, 7-6(3). Both US girls lost in the quarterfinals, with Michaela Gordon dropping a 6-3, 7-6(4) decision to Vera Lapko of Belarus and wild card Tornado Alicia Black losing to No. 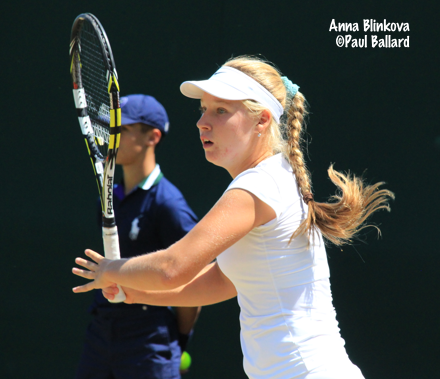 12 seed Anna Blinkova of Russia 1-6, 6-3, 12-10 in the longest match of this year's junior tournament. Blinkova had lost badly to Black in Junior Fed Cup play last fall in Mexico, and trailing Thursday 6-1, 2-0, she told herself she must change her attitude. "It was so terrible match for me," said the 16-year-old from a small town outside Moscow. "I lost 6-3, 6-0 because of my fears. I saw her and I didn't know what to do with her. She was running very fast, very quickly and I missed every ball. It was the most terrible match of my life and you know, I remember it almost every day, think about it almost every day. Today I wanted to win so much. But when it was 6-1, 2-0, I said to myself, you have to relax, because you miss every ball." Blinkova served for the match six times in the third set, at 5-4, 6-5, 8-7, 9-8, 10-9 and 11-10. Black's determined defense and more than a few nervous errors from Blinkova kept the Russian from getting a match point until the 9-8 game. After two forehand winners from 30-40 down (she had 63 winners in the match compared to Black's 12), Blinkova had her first match point, but couldn't put away a swing volley and then sent Black's reply wide. Match point No. 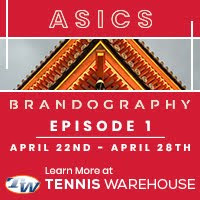 2 was another 20 minutes away, but with a 40-15 lead, Blinkova needed only the first point, hitting her only ace of the three-hour and seven-minute match. 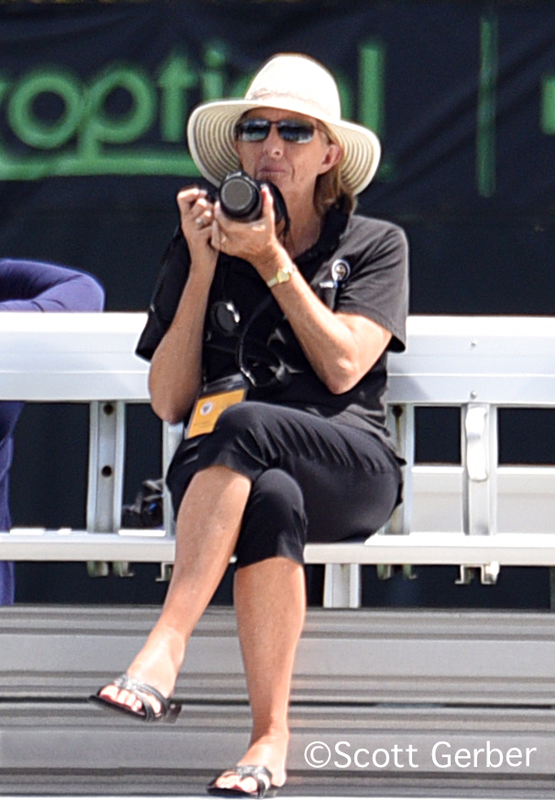 "I was serving for the match many times, and at last I said, I have to finish this match right now," said Blinkova. "You know, I had some problem with my serve in the third set, and I'm so happy that I could finish the match with an ace." The other girls semifinal will feature unseeded Sofya Zhuk of Russia, who beat wild card Anastasia Potapova, also of Russia, 6-4 ,6-3, and qualifier Viktoria Kuzmova of Slovakia. Kuzmova put an end to the hopes of Great Britain's Katie Swan, defeating the No. 5 seed 7-6(2), 6-0. Five US boys have reached the doubles quarterfinals. Top seeds Fritz and Michael Mmoh saved a match point to defeat Tim Sandkaulen of Germany and Mate Valkusz of Hungary 6-3, 6-7(6), 9-7 in two hours and 40 minutes. Opelka and Akira Santillan of Japan, the No. 4 seeds, advanced, as did No. 3 seeds Blumberg and Paul. The only US girl remaining in doubles is Ingrid Neel, who is playing with Great Britain's Maia Lumsden. Top seeds Miriam Kolodziejova and Marketa Vondrousova of the Czech Republic kept their quest for a girls doubles Grand Slam, beating Bianca Andreescu and Katherine Sebov of Canada 6-4, 6-2 in the second round. It is the 12th straight girls junior slam match the Czech pair has won this year. Friday's order of play is here. The junior draws are here. Additional coverage of today's quarterfinals can be found at the Wimbledon website.